Don’t forget that the Blue Cross RiverRink Winterfest begins this Friday! Bring friends, family, and that special someone to experience all the fun that this winter wonderland will have to offer. The focal point of the this attraction will be the the RiverRink that is back for it’s 20th year. 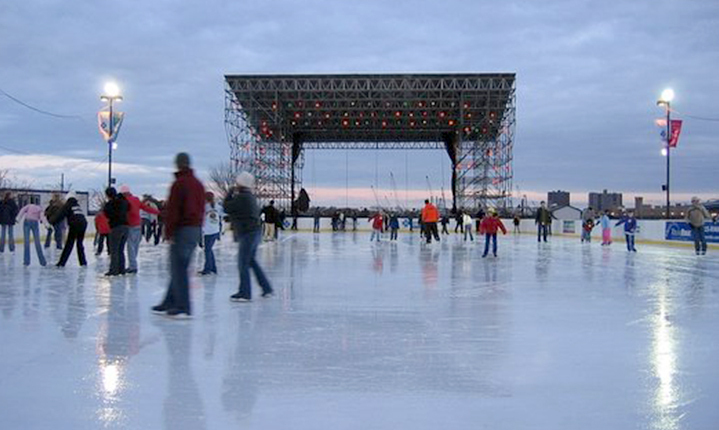 This regulation-sized ice skating rink located at Penn’s Landing is a fun place to ice skate or spectate while taking in views of the Benjamin Franklin Bridge and Delaware River. Enjoy the Delaware River Waterfront, beautiful lights, decorations, food, drinks, and shopping while getting yourself in the holiday spirit. There will also be a gorgeous winter garden area that surrounds the RiverRink that will include holiday trees, rustic furniture, and warming fire pits to ward off the cooler winter nights. Further, every half hour there will be a holiday lights show that is synced up to festive music and will be a delight to take in. After you enjoy some ice skating, consider heading in to The Lodge where there will be warmth, drinks, and tasty foods created by Garces Events Executive Chef Adam DeLosso to enjoy. To see more events that will take place here and the schedule, simply click here. Set your GPS to Market Street and Columbus Boulevard in Philadelphia to make your way to the Blue Cross RiverRink Winterfest. You can also call (215) 925-RINK for more information.